Gift Certificates are typically paper and homemade in your shop. The certificate balance is stored in Ascend and directly attached to a customer's account. So the sale should be associated with the person receiving the Gift Certificate (that will be redeeming it), and not the person buying it. Gift Certificates are mostly commonly used at shops that are not integrated with Chase Paymentech. 1. Create a new Sale and attach the customer who will be receiving the Gift Certificate. 2. Take their payment for the Gift Certificate (for example, $50 in cash). 4. Select Gift Cert from payment types. 5. 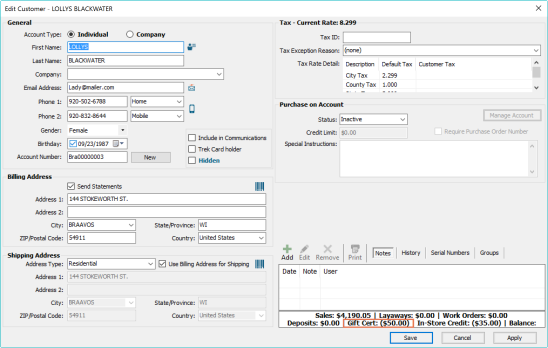 The Amount will automatically in fill in with the negative amount in the balance field. 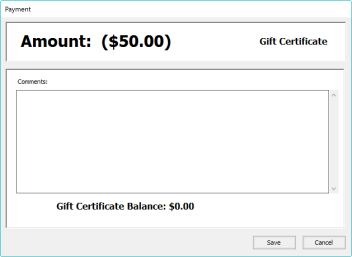 The Gift Certificate Balance shows their current balance (which this new payment will be added to). If you open the customer record (for the customer receiving the gift Certificate), you'll see their Gift Certificate balance has been updated and can be used to help pay for store purchases.